Education and Training Co-ordinator, Fran Long, summarises the successful start to the PhD Cluster training programme and our plans for outreach activities. 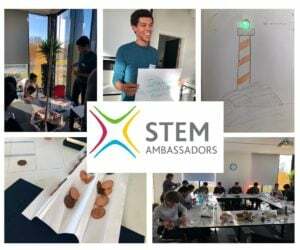 In November the Faraday PhD Cluster students joined us at headquarters at Harwell to begin their STEM Ambassador training, which was facilitated by Claire Hamnett of STEM Learning and myself. The hands-on practical course was interactive and thought provoking. Students will return in January to consolidate their learning and develop engaging battery-related presentations to take into local schools to inspire young people about STEM careers. While in Oxfordshire, the Cluster students got the opportunity to have their first industry visit (top photo). Rob Millar, Head of Electrical at Williams Advanced Engineering, showed them around their site and presented an engaging talk about battery technology advances and applications. The PhD students will meet again later this month in Newcastle, where their second course will include the disassembly and reassembly of a Nissan Leaf battery pack, and a trip to the Nissan assembly line. As part of our outreach programme, the Faraday Institution was delighted to sponsor and present at the Buckinghamshire Young Scientist of the Year Award ceremony in November, which recognised young people’s achievements in science. 58 talented year 13 pupils won awards at the event run in partnership with Science Oxford and the Buckinghamshire Learning Trust. There, I spoke about the challenges facing society and the opportunities young people have to be part of the next generation of scientists and engineers that will be needed to research ways to overcome these challenges – including in developing battery technologies - in new and creative ways. The Big Bang Fair 2019. Can you help? On 13 – 16 March 2019 the Faraday Institution will be showcasing battery technologies and building science capital with pupils, teachers and families at the Big Bang Fair. This is the biggest celebration of STEM for young people in the UK. We are looking for exciting interactive ways to communicate how batteries work and the type of research being carried out in the area. Do you have batteries or related equipment and artefacts that could be used or displayed? Do you already have tried and tested practical activities that pupils can take part in to further their knowledge and understanding about battery technology and inspire them about STEM careers? Whether a signed-up STEM Ambassador or not, we would welcome support on the stand from researchers from each of the project teams, to talk with attendees. Do think about volunteering for one day (or more) of the event. Training will be given where needed to maximise the opportunities of presenting to these audiences. If you have any suggestions for novel battery related freebies we can give away then please do let us know. For further information or to volunteer your help please email Fran Long.